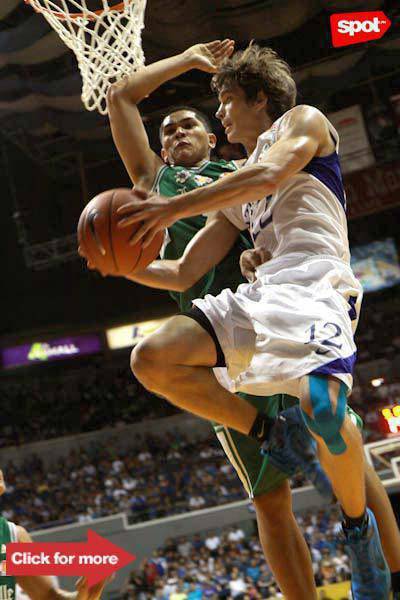 "It was like a nightmare," La Salle Coach Dindo Pumaren said. 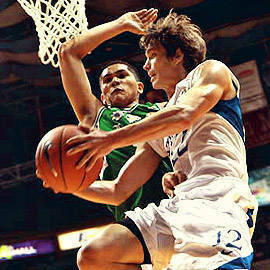 Green Archer Philip "Papot" Paredes against Blue Eagle Kirk Long. Click for more photos. The August 22 bout between archrivals Ateneo Blue Eagles and La Salle Green Archers was a sweet day for the Katipunan crowd--the Eagles soared to second place with 8-2, and enjoyed a double-digit cushion almost all throughout the game, ending the match at 74-57. The second round game was quite different from the first ADMU-DLSU match when the Eagles saw their nine-point lead vanish during the last three to four minutes, and the Archers won, 66-63. Needless to say, the Eagles have definitely avenged their earlier loss. 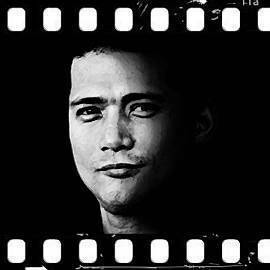 "We tried to develop a second unit the entire year to keep them ready once our starting unit gets into foul trouble... Today, the second unit was able to step up," Ateneo Coach Norman Black said, according to GMANews.tv. La Salle Coach Dindo Pumaren said, "It was like a nightmare... We had a bad start and we didn’t play La Salle basketball." Player of the game Kirk Long, who scored a career-high 22 points, said in the GMANews.tv report, "The first couple of minutes, I felt like (La Salle) came out with a lot of intensity, but we were able to match that and we were able to execute on both ends."